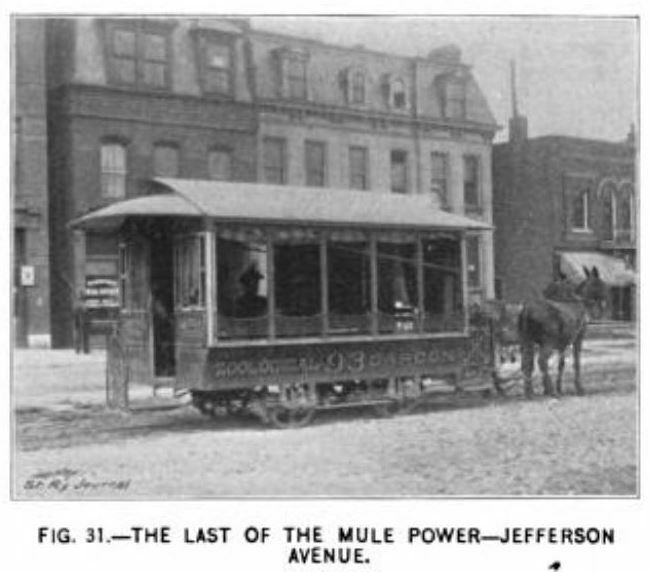 from The Street Railway System of Saint Louis. 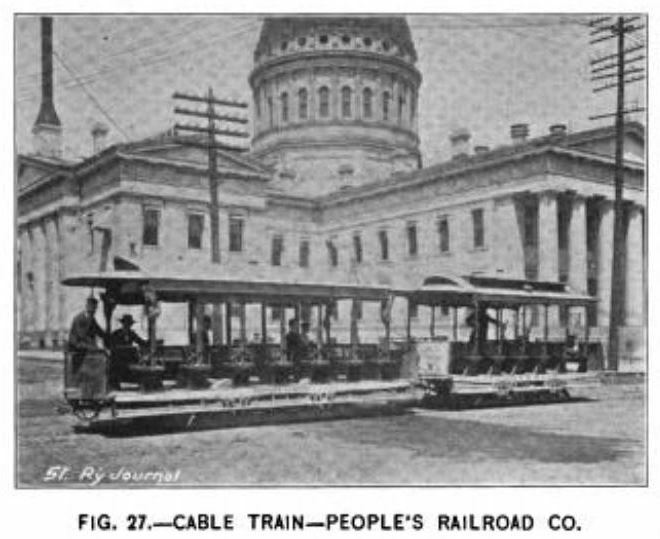 This article, from The Street Railway Journal, June, 1895, describes the cable, electric, horse and steam-powered systems in Saint Louis. I am including mostly items about the systems that used cable traction. Efforts have been made at various times to consolidate all the city lines under one management, but that present there is little hope that consolidation will be effected, as the Legislature has just passed a law limiting the capital of corporations (other than steam railroads) doing business in the State to $10,000,000. Great economies could be brought about, however, were this done, principaly in the reduction of power stations, of which there are eleven, each having its own engineer and operating force. It is possible, that an agreement can be made to erect one or two general power stations to be owned in common, and from which all systems can be supplied at a fixed price per car mile. A brief description of the individual systems of the city will be of interest as an introduction to the more technical discussion of plant and equipment which follows. This company operates what is locally known as the "Chicago Syndicate System," comprising the lines of the Citizens' Railroad Company, the St. Louis Railroad Company and the Cass Avenue & Fair Grounds Railway Company -- a total of 73.33 miles of track, of which 57.18 miles are operated by electricity, 14.7 miles by cable, and 1.48 miles by horses. The territory served by this company is considered to be, perhaps, the best in the city. The system is in charge of Capt. Robert McCulloch, general manager. This company operates about twenty-five miles of track by both cable and electric traction. The lines extend, generally, in a westerly direction and terminate in the vicinity of various parks and pleasure resorts. Mr. P. C. Maffit is president and general manager and has entire control of the affairs of the company. THE ST. LOUIS & SUBURBAN RAILWAY COMPANY. This system embraces twenty-eight miles of track and, as its name implies, is both a city and a suburban line. The city terminal is at 6th and Locust Streets. Thence, for a distance of eight miles, there is a double track which terminates at Wells Station, and from this point is a single track road to Florissant, a small village 18.3 miles to the westward. From 36th Street out, the line owns its right of way. The road has a very interesting history. The city division, to 39th Street, was formerly operated by cable, and was known as the St. Louis Cable & Western Railway. From this point out, the system was a narrow gauge dummy line. The city end was operated by cable from April 15, 1886, to October 27, 1891, when electricity was installed. The steam division was equipped for electric operation in December, 1891, this being one of the first dummy lines in the country on which electricity was substituted for steam power. The suburban end is through a rich farming county sparsely settled, but here and there are small hamlets, so that there is considerable long distance travel. it is also a favorite pleasure route, the pleasure traffic during summer evenings being quite large. This system is operated under the direction of its general superintendent, Mr. T. F. Sneed. This is a cable railway and began operations on April 20, 1890, and little or no change has been made in the line since that time. The electric lines of other companies have cut into the territory at each end and paralleled the line in so many places that traffic has been seriously interfered with. the line is quite crooked, having twenty-four curves. The rails on the Broadway cable line, which have now been in service five years, show but little sign of wear, although it has been necessary to repair most of the joints several times. Some of the joints, however, have never been adjusted since the road was constructed. Considerable trouble was experienced last winter by the closing up of the slot on some portions of this system, from the excessive frost pressure. The trouble, however, was nearly all on one track, for which there is no reasonable explanation, except that an inferior yoke was probably employed on certain sections. This, doubtless, has broken, and so allows the slot to close. The closure at no place was for a very great length, but the trouble occurred at frequent intervals along the line, occasioning considerable delay in the operations. The tracks for the Olive Street cable line were laid with sixty-eight pound girder, and on this line there have been a great many low joints. By comparing rails recently removed with a new section it is observed that about one-eighth of an inch has been worn from the tread and the shoulder, and that the tram or flange has been depressed by the weight of vehicle traffic about one-eighth of an inch. Recently the joints have received a thorough overhauling, and the fishplates, which had become worn at one end in the direction of travel, have been changed to the rails on the opposite track and reversed, so that it is expected they will give additional wear. It is found that the chafing of the rails tends to wear into the top of the yoke and also into the rail, so that metal shims of different thicknesses have been added from time to time. In recent repairs a shim one-eighth of an inch thick has been employed. For a considerable distance on the city end of the cable line, cast iron joint boxes were installed some years since. They are about two feet long and eight inches in width, and were designed to give access to the joint bolts, without removing the pavement. In practice, however, it is found necessary to remove the paving on the inside of the rail, and as the boxes are quite narrow, the object sought has not been realized. However, they provide a rest for the ends of the rail, in addition to the yoke, and help to keep the rail in position. The city terminal of the St. Louis & Suburban system is laid with a five inch, seventy pound girder rail, with the ties resting on the concrete of the old cable foundation, making a very substantial track. From 39th Street out, the tracks of the suburban end are laid with a forty pound T rail, the construction being the same as for steam railways. The joints are bonded, and there is a supplementary return wire. For so light a rail, the track is holding up remarkably well. The lines of the three systems controlled by the National Railway Company are operated from three power houses, two caring for the Broadway cable line and the third, the Cass Avenue station, the electric lines. The boiler equipments of each of the cable stations consist of two 500 H. p. Hazleton boilers and two 1,000 H. P. Wheelock engines. In the basement of the North Broadway station, underneath the floor of the tension run is a large cistern about twenty-five feet in width, 150 ft. in length and four feet in depth, the walls being of brick with cement lining. This cistern is used for catching the rain water from the roof of the station, which is then used for the boiler feedwater. A three hours' rainstorm is usually sufficient to provide for a three days' supply of feedwater. A portion of the feedwater is derived from the city mains, but it is found that the use at intervals of rain water serves to remove whatever scale has accumulated in the boilers from the use of the city water. The effect has been very beneficial and it has not been found necessary to clean the boilers oftener than once every two or three months. Pea coal is employed in this station and costs, delivered, about $1.00 a ton. The ropes are purchased chiefly from Broderick & Bascom, though some are from the California Wire Works. 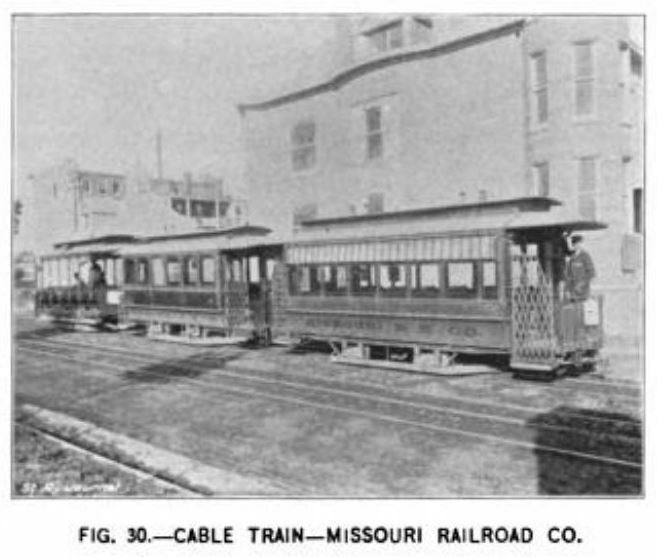 The power for operating the lines of the Missouri Railroad Company is derived from two stations, one for the cable and the other for the electric cars. The steam equipment of the cable station consists of two 500 H. p. engines. Although these have been in constant operation since 1888, they have stood up exceedingly well and have required no important repairs. The winding drums are coupled in pairs by two cotton ropes running over sheaves mounted on the drum shafts, which are designed to assist in driving the idler drums to prevent the slipping of the cable in the groove, and are considered of great advantage. Among the auxiliary appliances of the station is a ventilating fan designed by one of the engineers, and used in warm weather for ventilating the station. It is operated from the main shaft. A signal system is also used, with signal boxes located on the posts on the street, every three or four blocks. The conductors of the cable trains are provided with keys for these signal boxes, and in case of accident can readily signal the power station. In the power station of the St. Louis & Suburban line, which is located about 6 1/2 miles from the city terminal, the generators are driven by three Hamilton-Corliss engines, with cylinders 31 X 72 ins., rated at from 700 to 1,000 H. p. each. The first of these is belted direct to two M. P., 300 K. W. General Electric generators. The receiving pulley is seventy-two inches in diameter, and is placed between the generators on the same shaft. The fly wheels of these large engines are twenty-four feet in diameter with seventy-four inch faces, and weigh 50,000 lbs. each. Two of the largest engines were previously employed in the cable power station. The power is transmitted through a seventy-two inch Shultz belt, which leads from a tightener pulley placed near the receiving pulley. The generators make 400 revolutions per minute, and the voltage of the station is 630. The cable power station of the People's Railroad Company is located at 18th and Park Avenue, and the boiler equipment comprises three 200 H. P. Heine boilers. Two 500 H. p. Hamilton-Corliss engines are installed, each having 30 x 60 in. cylinders and running at sixty revolutions, at a steam pressure of 100 lbs. The engines are used alternately and have been in continuous operation since the road was opened, without material repairs. The method of coupling the driving drums was novel at the time the station was built, and consists of providing a supplementary rope drum on the shaft of each pair of winders, with which six cotton rope belts are employed. The power is transmitted from the engine shaft by a steel pinion which meshes into a wooden tooth gear on the shaft of the first pair of winding drums coupled as above. Solid winding drums have been employed, but the grooves have worn unevenly (some of them now being nearly two inches larger than the others) and a new set of the Walker differential ring type, has been purchased and is soon to be installed. Two ropes are run, and the life of the ropes is from six to eight months. Until recently Broderick & Bascom ropes have been chiefly used, but two Roebling ropes were purchased a short time ago. CAR HOUSE AND REPAIR SHOPS. The cars of the lines operated by the National Railway Company are stored in six car houses, two for the cable trains and four for the electric cars. The electric repairs are made at one principal station. The brick buildings provide for the housing of the cars of the Missouri Railroad Company's system. That for the cable line is close to the power house; that for the electric cars occupies half a block, and in connection with it are the principal offices and storerooms. Repair shops are run in connection with both stations. The leading in track is laid diagonally across the floor of the house, so that cars can be placed by each motorman on any of the storage tracks, without the use of a turntable, the double tongue or puzzle switch being employed to lead off from the diagonal track in both directions. THE NATIONAL RAILWAY COMPANY'S SYSTEM. This line has been recently changed from cable to electric traction, the last cable train having been operated in December, 1894, although electric cars had been run over the same track for some time previous. 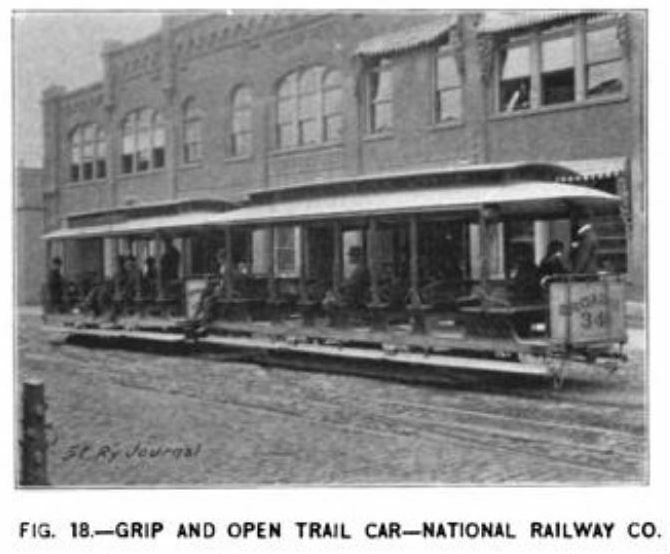 The trains of the St. Louis (Broadway) cable line consist of an open grip car and one trail car, there being a summer and a winter equipment of trailers. The open trailers are twenty-six feet long, and are provided with nine wooden cross seats, and were manufactured by the Brownell Car Company. The average number of trains run daily is fifty eight, but in busy seasons as many as seventy trains are in operation. The cars on the Olive Street cable line are usually run in three-car trains. They were built by Brownell, J. G. Brill Company, the American Car Company and the Laclede Car Company, and are all standing up exceedingly well under a long service. The open grip cars have been built over, or, rather, it has been necessary to replace the sills. The cars, being open, are exposed to moisture, and the sills have become destroyed, but there has been no such trouble with the closed cars. The grip trains are provided with a Jones continuous brake which operates in a very satisfactory manner. The company recently introduced an eight wheel car as a tow car on the cable line, in place of the two trailers usually employed. The experiment was made to see if a car of this construction would pass the curves at the high rate of speed at which the cable is run, the two branches of the line being run at about nine and a half and ten and a half miles per hour. No trouble was observed in running this car, and others will be employed in a similar way. On the People's Railroad Company's system two-car trains are run, consisting usually of a grip and trailer, open or closed trailers being employed according to the season. The cars and trucks were manufactured chiefly by the John Stephenson Company, Ltd. This is a well constructed system, but, like other cable roads in the city, considerable trouble has been experienced during the winter from slot closure, due to frost pressue. The Citizens' Railway Company purchases its electrical supplies principally from Arthur Partridge. The ropes for the cable line are purchased from Broderick & Bascom, of St. Louis, and the California Wire Works Company, of San Francisco. At the north power station of the Broadway cable line a coal elevating mechanism has been installed (Fig. 41). This consists of an endless chain of large, nearly square links, united in a peculiar manner, the links being made of about one-half inch square iron. This chain operates along the bottom of a slightly inclined trough, with inclined sides, and which extends from the street at the rear of the station beside the steam tracks, and in position so that the coal can be shoveled directly from the car upon the chain to a bucket elevating device near the center of the station, about fifty feet from where the coal is supplied. 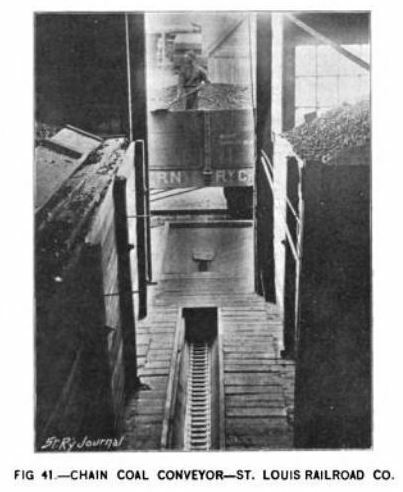 By the buckets it is elevated about fifty feet, when it is discharged upon a V-shaped platform, by which it divides the delivery to two other horizontal conveyors which deposit it in the bins above the furnace, from which it descends by gravity to the stokers. The power for operating the conveyor is generated in a twenty horse power engine, stationed near by, and from which the power is connected with the different conveyors by means of endless rope belting. This engine is also in position to be readily coupled to a shaft extending through into the tension run room of the station, where the power may be utilized for operating the reel when it becomes necessary to take out a worn rope. TRUCKS FOR SIXTY FOOT RAILS. Mr. McCulloch has had constructed two forty-five foot trucks (Fig. 42) for hauling the sixty foot rails which are employed in reconstructing the Easton Avenue cable line. The platform of this truck is constructed of two 2X 8 in. beams reinforced by long truss rods and a system of brace rods, between them. The rear wheels are fitted with a hand gear wheel and circular rack modeled after that employed on ladder trucks in fire service,so that street corners may be easily turned. There is a seat behind the wheel for the pilot, and the truck has a fifth wheel to prevent the tendency to capsize in making turns. The truck is painted red, and would seem to be a very useful vehicle for the purpose for which it is designed. A double, flat link coupler is employed on the cable cars of the different lines. It is held by a pin in the recessed ends of the drawbar and to provide for the wear of links and pin a staple with flat, tapering ends is inserted vertically between the ends of the drawbars. This staple is attached by means of a chain to the platform and serves to take up any slack, and prevents the jerking which is usually a necessary incident to coupled cable cars. On some of the electric trains of the Citizens' Railway Company a wedge shaped spike is employed for taking up drawbar slack. This is held between the ends of the drawbars by a slot in the coupling link, the latter being a flat plate. In speaking of the relative economy of cable and electric traction, General Manager McCulloch is of the opinion that where a line earns only $50 a day, per mile of single track, it is more economical to operate by electricity, but at $100 per day per mile, the cable is the cheaper. It has not been decided whether or not to operate the Broadway cable line by electricity. Were the traffic as heavy as formerly, there would be no question about the relative economies, but if the traffic should be much less than at present, electricity would probably pay as well. 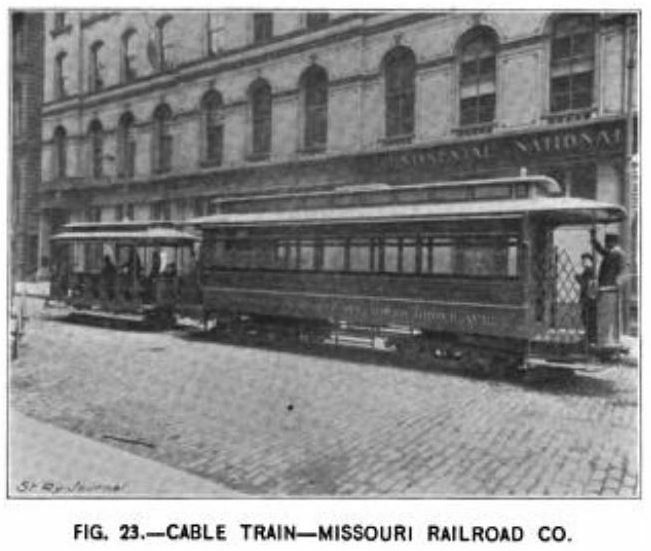 President Maffitt, of the Missouri Railway Company, stated that the Olive Street cable line was parallel with an electric line, and that he thought he could not operate the electric line by cable as cheaply as it is now being operated by electric power, neither could he operate the Olive Street cable line by electricity nearly as cheaply as it is now being operated by cable, the difference being in the amount of traffic. Copyright 2015 by Joe Thompson. All rights reserved.